Hataraku Saibou (Cells at work) is by far the most charming show this year. The characters, the world, the humor, it is all so charming. I am thankful for this OVA because it reminded me of that fact. Oh yeah, the OVA is great too. The story is just cute. A normal Cell is bored and comes across an mysterious cell and together they do a ton of pranks. The interactions it brings with it are not only charming but also freaking hilarious, even if it sometimes seems a bit too mean (I won't forgive you for hurting my RBC. I won't). The animation is still the same (good animation but kinda rough artstyle) and that goes for the music and characters too. Yeah.. this OVA is exactly what I expected of this anime. If you watched Cells at Work then I see no reason to not watch it. I hate colds. It's been a long time since I've caught one but just to think about it makes my mind boggle. 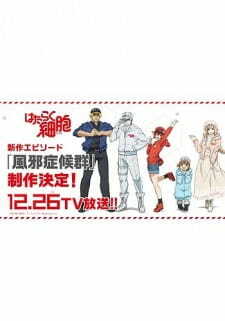 Watching Hataraku Saibou (Cells at Work) once again brings in an experience that few can match this year. I'm talking about the exploration of the human body in the most creative ways. Returning to this franchise felt like yesterday despite the gap of a few months. My first impression is how the humor works so well when we see how the human body functions. For this particular special, the common cold is the culprit. When we picture a cold, it's often about a runny nose, cough, sneezing, or a sore throat. This episode took that and made into a humorous gag with how cold operates in the body. It's creative enough to show how colds operate yet also keeps in pace with the effects. In response, Killer T cells make their reappearance and I'd describe them as a blend between badass and goofballs. An ingenious anime with colorful creativity and realism with its own story.